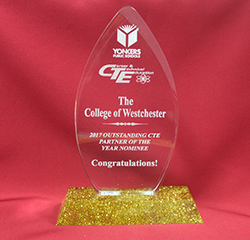 The College of Westchester (CW) received the Business Partner of the Year award from the Yonkers Career and Technical Education Advisory Council. CW obtained this award for its work with Roosevelt High School and its Early College Studies (RHS-ECS) program on developing a novel Dual-Enrollment program, serving RHS-ECS students on CW’s campus in credit-bearing Jump Start courses, and working closely with RHS-ECS faculty and students in its Business and Media Communications Studies program on a marketing campaign. The awards were presented by the Yonkers Public Schools at the Castle Royale in Yonkers during a Celebration Breakfast in May, 2017. Maryanne DeSalvo, Estelle Coffino, and Dr. Warren Rosenberg attended the event representing CW. “The College of Westchester has had a long a fruitful relationship with the Yonkers Public School District and we’re honored at being recognized today both as a nominee for the District-wide Outstanding Business Partner Award and for being named Business Partner of the Year by Roosevelt High School Early College Studies Program. As a graduate of Roosevelt High School (Class of 1972), this award has special meaning to me and I look forward to a continuing and productive relationship helping the students of Yonkers achieve their long-term educational goals,” said Dr. Rosenberg. Yonkers Public Schools (YPS) is the fourth largest school district in New York State, located in the lower Hudson Valley. YPS is a learning community of 27,000 students from 100 cultures, backgrounds and nationalities in grades pre-kindergarten through 12 with a rigorous core curriculum and innovative programs in 39 schools throughout the City of Yonkers.